Packaged Customer Data Platform (CDP) technology has risen on many MarTech agendas for some good reasons. CDPs can give marketers a much more adaptive environment from which to activate customer and prospect records. Now you can choose from at least 24 plausible CDP platforms. Which one is right for you? On the surface they mostly look the same, but underneath the covers they can behave quite differently. 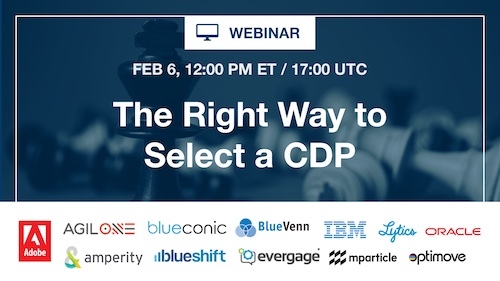 Sign up for this live briefing, where RSG Founder Tony Byrne will explain how to pick the right CDP. Based on RSG's usual hard-hitting evaluations of major CDP vendors, Tony will tour the market and offers a practical methodology for selecting the platform best suited to your particular needs.